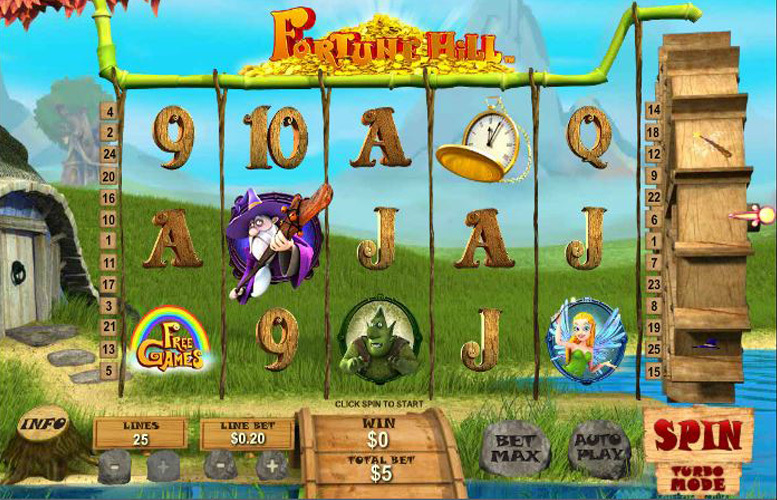 If magic and fantasy float your boat then the Fortune Hill slot from Playtech might be just what you’re looking for. Clearly influenced by Tolkien, although lacking the official nod to the great author, the game’s background looks like it could easily be Bilbo Baggins’s own front porch. With luscious graphics, playful sounds, and a stunning backdrop, it’s as much a treat for the senses as it is potentially one for bankrolls. There’s three great bonus stages too making for a constantly varying gameplay experience, and showing Playtech’s innovation in slot design. 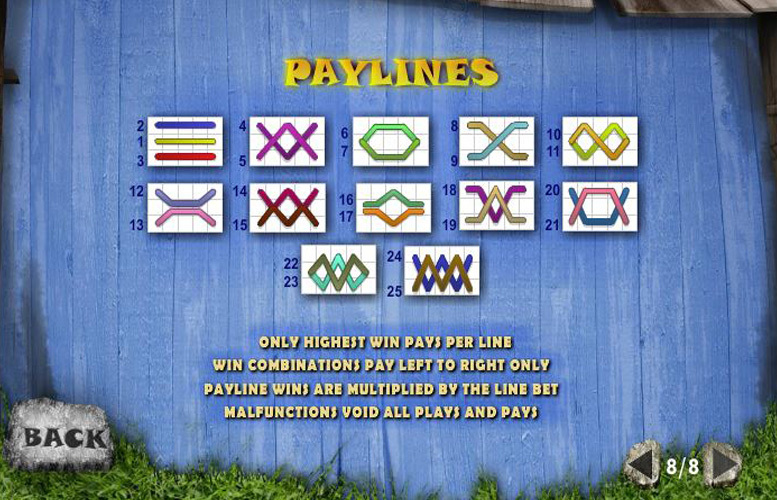 Up to twenty-five pay lines makes for a substantial number of ways to win when set to the maximum. Gorgeous imagery throughout the game. The attention to detail is remarkable, and helps create a memorable gameplay experience. There’s a total of three different bonus features. This sets Fortune Hill apart from many of its contemporaries that offer only one, or two different gameplay modes. The music can get repetitive. This is, of course, a matter of personal preference but fortunately, if the spritely, upbeat tune accompanying the gameplay isn’t for you, you can always mute it within the game options. The high value symbols for Fortune Hill are all fantasy inspired. There’s the “wild” wizard, an elf, a pixie, and a goblin-type creature. 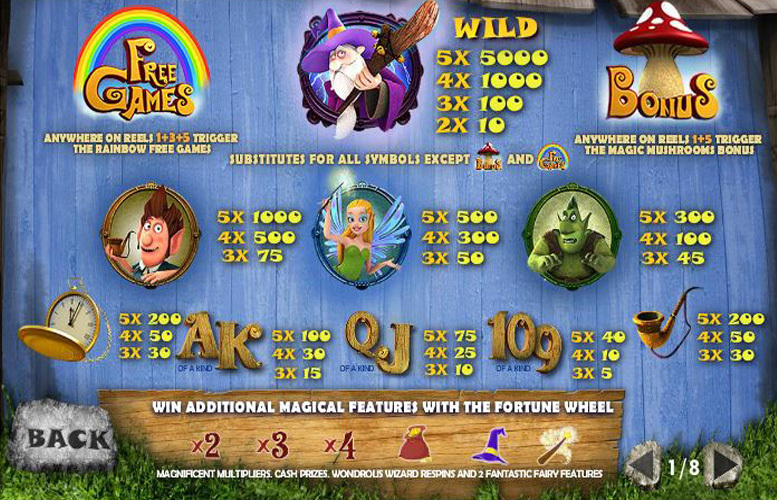 The highest value of the symbols is the wizard himself, awarding the player 5,000 coins for five-of-a-kind. Next, it’s five elves earning 1,000, then five pixies for 500, and finally five goblins will bag you 300 coins. The maximum possible bet on the Fortune Hill slot machine is £5. This means that the highest win is a massive £25,000. Get lucky and spin in five-of-a-king wizards with a bonus multiplier, and you’ll really understand why they call it Fortune Hill. Fortune Hill really excels when it comes to bonus features. Where they seem an afterthought on some machines, the importance of solid additional rounds in improving gameplay experience hasn’t been overlooked here. One of the most striking things players will notice about the visuals for Fortune Hill is the enormous waterwheel constantly turning to the right of the reels. 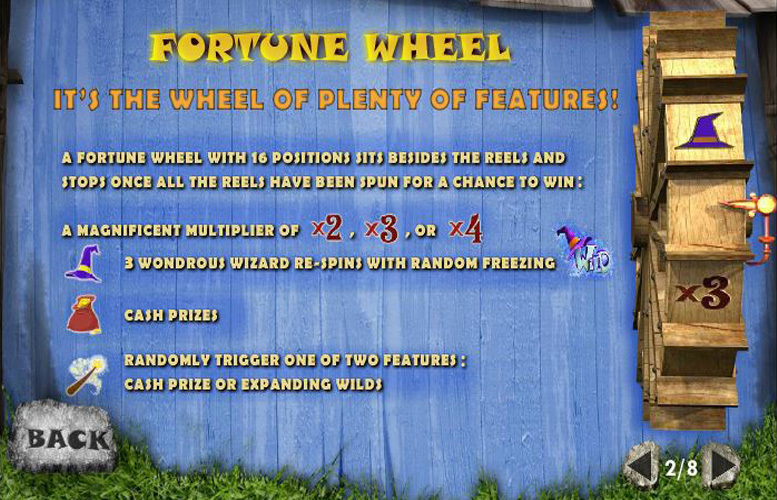 Each of the wheel’s sections contains a different prize, and every time players spin the reels, they’ll get a chance to win one of them. On offer are various multipliers, extra wilds, frozen reels, re-spins, random cash prizes up to 6x the bet, and expanding wilds. This feature is a constant throughout the game, and players needn’t reach a special stage to play it—it just takes a little luck to win some of the juicier prizes on offer. This one’s a typical “pick the box” type game. If players successfully land the mushroom symbol on both reels one and five simultaneously, they’ll be taken to a cliff top where they must select mushrooms. Cash prizes are awarded for each, until the “collect” mushroom is chosen. Players then resume the regular game. 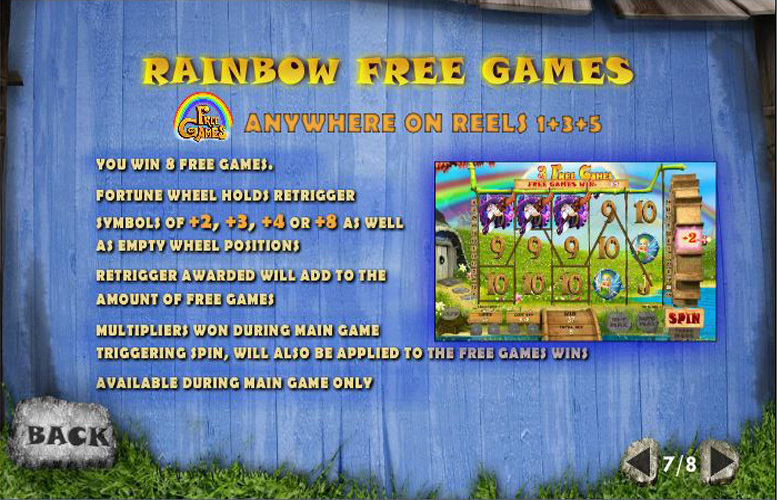 If you’re fortunate enough to land the “Free Games” symbol on reels one, three, and five you’ll receive eight free spins. This can occur indefinitely. In addition to the high value symbols, there are also a few lesser priced ones amongst the reels. These consist of a pipe, a pocket watch, and the typical higher ranked cards from a standard deck. 200x the coin value for either the watch, or pipe. 100x the coin value for the Ace, or King. 75x the coin value for the Queen, or Jack. 40x the coin value for the 10, or 9. Of the many great things about Fortune Hill, the number of different ways you can vary your bet size is certainly up there with the best. You can adjust the number of coins bet per line, the value of each of them, and the number of active pay lines. Such features afford the player maximum control, and allows them to bet as they feel. Players can choose up to a massive 25 pay lines active at once, a choice between one and ten coins staked per line, and the ability to set each coin between 1p and £5. This makes the maximum possible bet per spin a substantial £1,250. Fortune Hill is without doubt one of the most visually appealing slots out there. It’s got a great animated introduction, and some amazing opportunities to win big. All told, it’s one of our absolute favourites. We really had to scrape the barrel to find something we didn’t like about it, and even then, the music is taste dependent, and it does compliment the overall theme of the game. If you’re into fantasy literature, Tolkien, or the Lord of the Rings Trilogy, you’ll likely be impressed by Playtech’s representation of The Shire, and their effort at bringing the worlds of magic, and casino gaming together. This game has a rating of 5 / 5 with 878 total reviews by the users.